Walmart has just published an image of the one Jurassic World set that we didn't already have an image for: 75933 T. Rex Transport. It contains three minifigs: Zia and two guards, plus two dinosaurs. I could only see one until I looked closely and noticed the cute baby T-Rex over on the right. You'll find a larger image of it after the break. Thanks to Mjmannella and shima55 for the news. That's not a baby T-rex, but Baby Blue. I don't know who this Zia character is, but that is one cool fig. A LEGO truck that doesn't look like total garbage!?? I don't know how I feel about the baby T-rex. I know already that I'm going to want a few of these, great parts on show. I feel like LEGO are doing a great job at the moment, my wants list has never been longer! 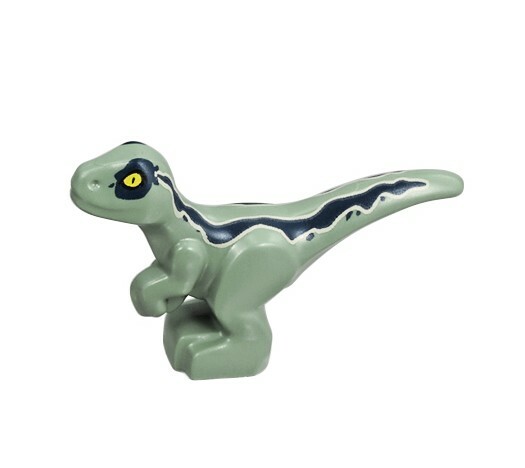 Our TRU had a big list of Jurassic sets on their website. Maybe some of them are yet to be revealed? Clearly a young velociraptor, not a T-Rex. Cool set. And recce, cool link! I love the colorsheme on the T Rex. The truck and specially the trailer look pretty solid, there are some really nice textures and finished details all over the build. I appreciate the effort considering that it is an exclusive set and also comes with the strong selling point that is the T-Rex. Kinda reminds me of the scene from Lost World where the two oarent T-Rexs come for their baby in the weird tunnel van thing. One of the best sets from the Jurassic line and had I didn't already had a Rex this would be on my list, that trailer and the truck is awesome. This set makes so much more sense than the first version from 2015. Does anyone know when the JP/ JW sets are being released in the UK? I am uncertain. It is definitley better than the last wo big Dino-Transports, but still. It looks kinda boring and a bit to broad for my taste. Maybe it is just the picture. Am i the only one who thinks that T-Rex (the big one, not the misidentified baby,) is looking a little pale? Just saying, if the big guy's been running around on a tropical island for... however long it's been, in-universe, since The Fall of Jurassic World, shouldn't he have more of a tan? Anyway, the truck looks pretty nice, (for Lego,) and i wouldn't be surprised to see it turn up in a truck stop MOC sometime in the future. Albeit, with a more... conventional trailer. @Spartan Ghost one of the Juniors sets comes with Rexy as she appeared in the last line of Jurassic World sets, this is probably a different/non-cannon T. rex as they've had a tendency to do that for JP/JW. Given that this set has a new T. rex but the old one is still in a Juniors I'm super happy. That makes two unique rex patterns to collect in one year! How cool, just like 2012. 5886 still the best T-Rex transport set of all time. OF ALL TIME! Spartan Ghost, I think this is a different T-Rex than the main one from Jurassic Park 1-2 and Jurassic World. Or maybe in her old age she is getting lighter skin. But she is getting up there in age, and has been moved around a lot. My favorite dino transport is 5975. But this set is nice and actually makes sense storywise, unlike the last set. A LEGO set called "T-Rex Transport" that includes a T-Rex, a baby T-Rex, a truck with a detachable cage trailer, and one female minifig in a set otherwise populated with male minifigs? P.S. also, just wanted to point out that you both had some interesting hypotheses. I agree that the semi truck looks great, although I'd probably modify the trailer to something more conventional using those great currugated panel pieces. The baby Blue is very appealing as well, and I really hope the polybag mentioned by @gatorbag will be available in my area. Two baby dinos are always better than one! Btw, love that torso on the female minifigure!